A weird wonder of Argentine and modern literature and a crucial work for Julio Cortázar, The Seven Madmen begins when its hapless and hopeless hero, Erdosain, is dismissed from his job as a bill collector for embezzlement. Then his wife leaves him and things only go downhill after that. Erdosain wanders the crowded, confusing streets of Buenos Aires, thronging with immigrants almost as displaced and alienated as he is, and finds himself among a group of conspirators who are in thrall to a man known simply as the Astrologer. The Astrologer has the cure for everything that ails civilization. Unemployment will be cured by mass enslavement. (Mountains will be hollowed out and turned into factories.) Mass enslavement will be funded by industrial-scale prostitution. That scheme will be kicked off with murder. “D’you know you look like Lenin?” Erdosain asks the Astrologer. Meanwhile Erdosain struggles to determine the physical location and dimensions of the soul, this thing that is causing him so much pain. Brutal, uncouth, caustic, and brilliantly colored, The Seven Madmen takes its bearings from Dostoyevsky while looking forward to Thomas Pynchon and Marvel Comics. Roberto Godofredo Christophersen Arlt (1900–1942) was born in Buenos Aires to German-speaking immigrants. Raised in tenement housing, Arlt was the only surviving sibling of three. Although his mother read him Dante and Tasso from an early age, Arlt was expelled from elementary school at age eight. Seeking to escape his austere and abusive father, and under the sway of Baudelaire—a self-proclaimed “spiritual father”—Arlt ran away from home at sixteen and began working odd jobs to support himself as a writer. He published his first novel, The Mad Toy, in 1926. 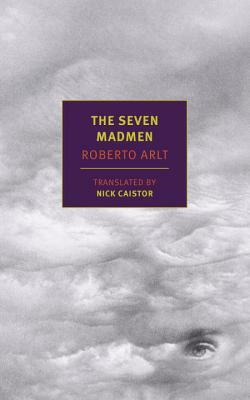 The Seven Madmen, which Arlt considered his masterpiece, and its sequel, The Flamethrowers, followed in 1929 and 1931. In the 1930s, Arlt came to prominence as a journalist; he was probably best known for his column Aguafuertes porteñas (Etchings of Buenos Aires). Although he is posthumously recognized as one of Argentina’s formative modern novelists, during his lifetime Arlt found his work relegated to the margins of a literary world dominated by a wealthier and more polished class of writers. His first wife died of tuberculosis in 1940; he remarried the same year, and died of a heart attack at the age of forty-two, exhausted by travel and hardship. Nick Caistor has translated some forty books from Spanish, Portuguese, and French, including works by Eduardo Mendoza, Paulo Coelho, and Manuel Vázquez Montalbán. He has twice been awarded the Valle Inclán Prize for Spanish Translation and is the author of the biographies Che Guevara: A Life, Fidel Castro, and Octavio Paz. Julio Cortázar (1914–1984) was born in Brussels, grew up in Argentina, and spent his last three decades in Paris. His many novels and stories include Hopscotch, Blow-Up and Other Stories, and The End of the Game.